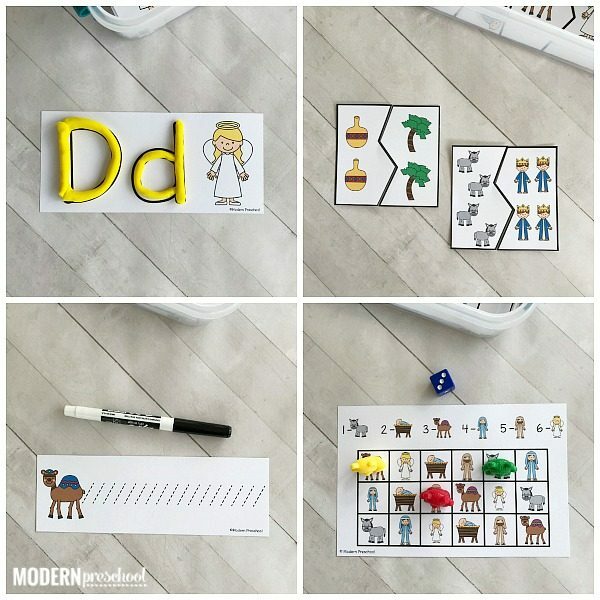 Have you noticed how hard it is to find quality Nativity themed learning activities for little learners? 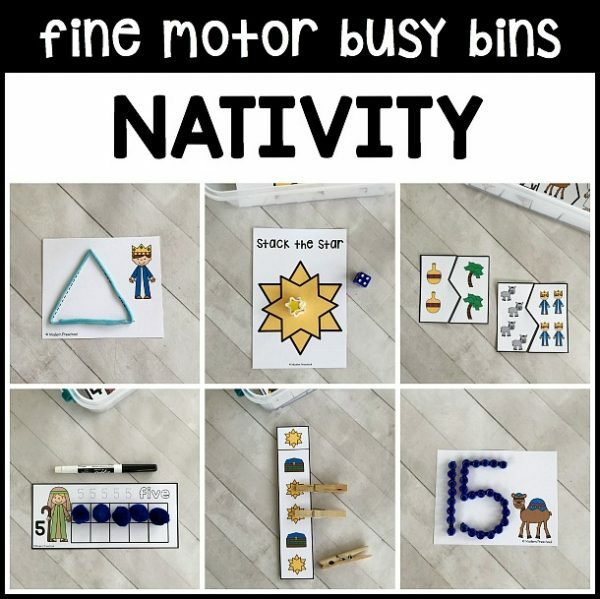 This is why you need our NATIVITY Fine Motor Busy Bins to go along with your teaching about the story of Christmas. 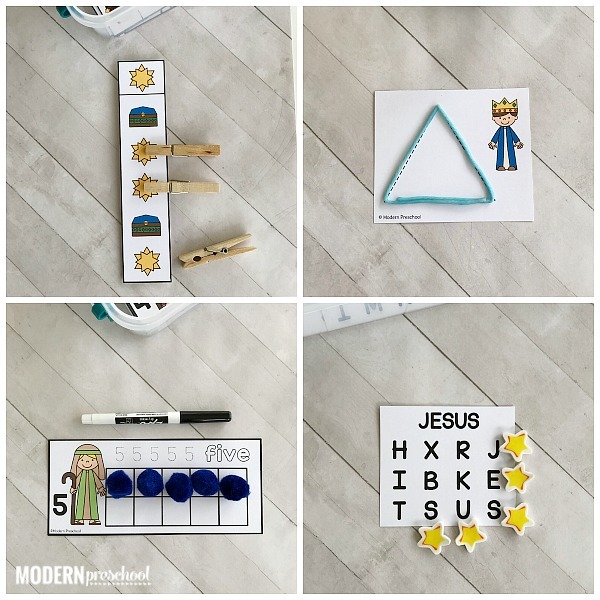 This set includes 12 Nativity themed activities that all work those fine motor muscles. Help set your little learners up for success in tying shoes, writing, and zipping skills. 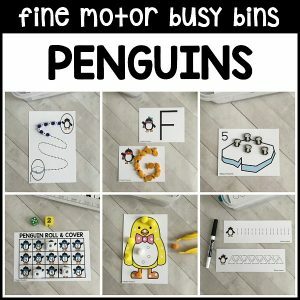 The busy bins are set up as completely independent morning work tub activities for pre-k. Teachers of younger preschoolers love to use them with their small groups – genius! —-> The Nativity fine motor busy bins are the 7th set in our ENDLESS Themed Fine Motor Busy Bins Bundle. The bundle is the way to go! Details are below about the NATIVITY fine motor busy bins in this set. Examples of all activities can be found in the photos above. 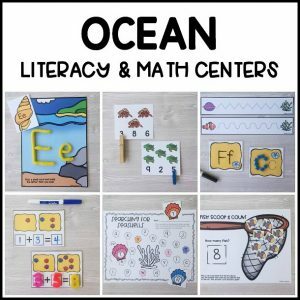 Print and prep the fine motor busy bins, and store them in small storage containers with lids (mine are from Walmart – some teachers use ziplock or colorful buckets). Switch out the 12 activities each time you switch themes. How awesome is is that?! 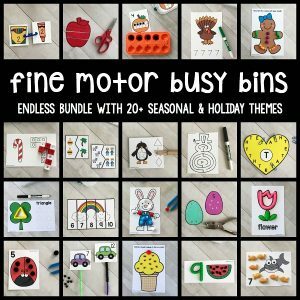 —–> This product is part of the Endless Themed Fine Motor Busy Bins Bundle. 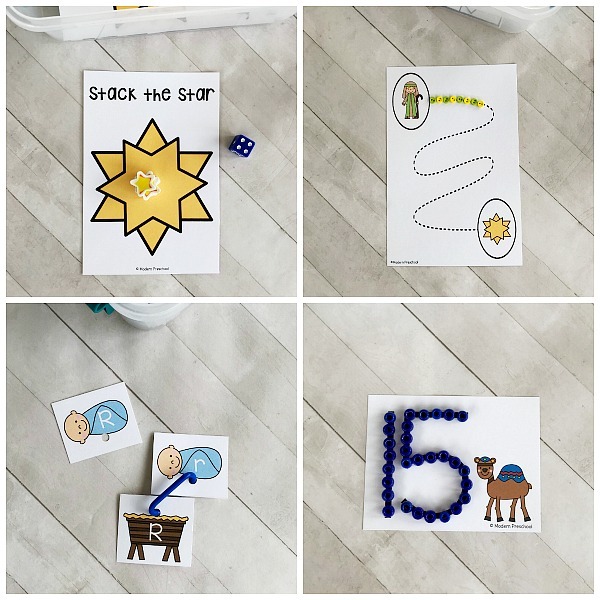 Camel Counting Cards 1-20 – Use beads to build the numbers on the cards to practice number formation and identification. Alphabet Manger Match-Up – Match uppercase or lowercase letters to uppercase letters by linking Baby Jesus to the manger. Stack the Star – Roll a die and add star erasers to the growing pile to see how many can be stacked before falling over. Trace & Write Cards – Trace letters to make words or pre-writing shapes and lines with dry erase markers. Angelic Alphabet Play Dough Mats – Build uppercase and lowercase letters with play dough. Shepherd 10 Frames – Add the correct number of pom poms to the 10 frame and then trace the number and number word. Find the Word – Find the letters in the word in the box and mark each letter with a mini eraser or counter chip. Nativity Clip Cards – Clip the pictures that match the top picture with clothespins. Wise Man Wikki Stix Shapes – Use Wikki Stix to form and trace the shapes on the cards. Roll & Cover – Roll a die, identify the number and the picture that represents that number, and cover it. 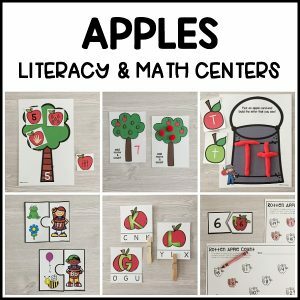 Number Count Puzzles – Count the pictures on the puzzles pieces and match together the pieces that have the same number. Follow the Star – Trace the path following the star with mini buttons or beads. And…there’s more!! 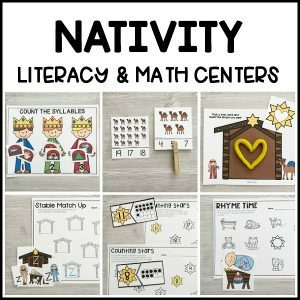 You’ll definitely want the Nativity Literacy & Math Centers to go along with the Nativity Fine Motor Busy Bins! 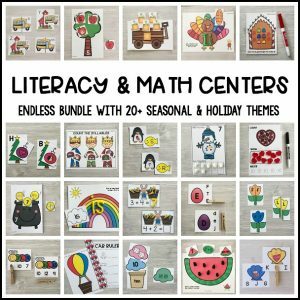 Check out the Santa Busy Bins, Santa Literacy & Math Centers, and too!